George Harrison has reportedly entered a New York-area hospital for further cancer treatment. The Daily Telegraph reports that the former Beatle was admitted to the Staten Island University Hospital under the supervision of Dr. Gil Lederman, who is known for his pioneering treatment of advanced cancer patients. Staten Island is richer today. how to play that F major 7th. While the world gently weeps...I cry hysterically...May my George rest in peace in the gentle arms of my sweet Lord, a God that he has longed to see. Each night before you go to bed....whisper a little prayer for George....and tell all the stars above..."This is dedicated to the one I love"
November 30, 2001- I woke from unsound slumber. I put on my London shirt feeling a common since of pride for my beloved Beatles. My mom took me to Brugger's Bagels for breakfast. When I got into the car a sharp pain went through my stomach. I didnt say anything because I wanted to go to school since there was a dance that night. When at the bagel shop, the pain was unbearable and my mom took me home. I entered my bedroom, greeted by the smiling faces of John, Paul, George, and Ringo. I glanced at a newspaper article posted on my wall. "Harrison undergoes cancer treatment in New York", the headline read. 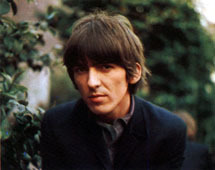 'God, please let him get better', I silently prayed for George as I lay down in my bed. When my mom came in with the thermometer, she commented on how pale I looked. I didnt have a fever, however, but my temperature was frightfully low. 'Whats wrong with me? ', I thought. My dad woke me up at 9:30 am and asked how I felt. I was feeling much better so I decided to go to school. I arrived in the middle of third period, health. When I entered the room I must have looked pretty bad, because my teacher asked me if I was alright. "Sure, I'm fine", I said. "Oh, I just thought maybe you were upset about George", she replied. 'George??? What happened to George??? ', I thought.